Cassius Marcellus Clay, Jr. was the older of two sons born in Louisville, Kentucky to Odessa and Cassius Clay. His mother worked as a domestic and his father painted billboards and signs to support their family. After 12-year-old Clay's bike was stolen, he vowed to "whup whoever stole it" to Louisville police officer and boxing coach Joe E. Martin. In an attempt to re-channel Clay's aggression, Martin introduced him to boxing. In the six years that followed, Clay won two National Golden Gloves titles, two AAU titles and the Olympic Gold Medal. 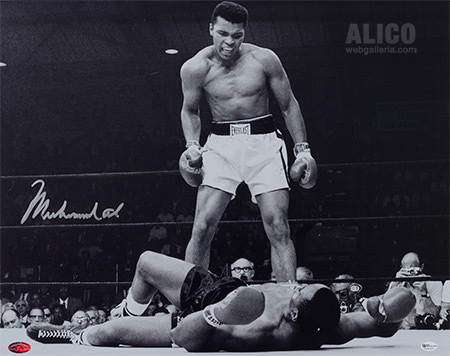 By the end of 1960, he had turned professional and went on to amass a 19-0 record before being given the chance at Sonny Liston's title in 1964. Liston was the overwhelming favorite going into the fight, but Clay "shook up the world" by winning the bout and the heavyweight crown.